Start of July 2016 I have been hiking with my son for a week in Norway. The weather was great (no rain) and we saw some beautiful nature. 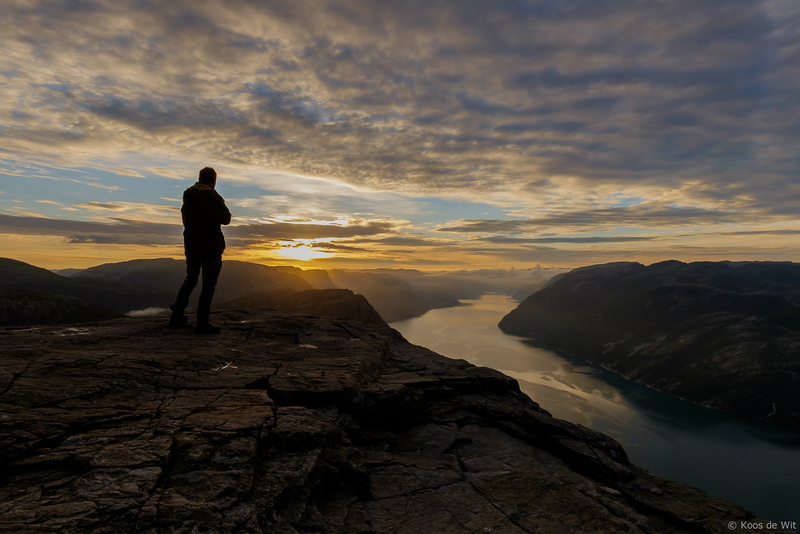 This is a shot of me (my first selfie ever…) watching the sunrise at the Preikestolen, Lysefjorden. The evening before we hiked to the top, saw the sunset there and put our tent near the top. At 04:00 o’clock I got up to see this… it was amazing! Taken at Sterrenbos, Groningen, The Netherlands. Yesterday I went to Amsterdam for work and at the Tjeukemeer I stopped to shoot this sunrise. I did this with my Fuji X20 and I love the Velvia film simulation colors and the silky water! Taken with the SR+ automatic scene mode delivering this JPG, which I only slightly adjusted. Taken at the Tjeukemeer, Friesland, The Netherlands.